Kirk Douglas Theatre, Center Theatre Group, Culver City, Calif.
No matter what the play – “King Lear,” “Death of A Salesman” or “Peter Rabbit’s Big Adventure” — if John Hurt is onstage, you know you’re in for a good theatrical evening. And if the play has depth and complexity, one demanding your close attention as well as all the skills of a gifted actor, you know you’re in for a very special theatrical evening. Samuel Beckett’s “Krapp’s Last Tape” is such a play. John Hurt is such an actor. A pairing like this doesn’t occur very often and so when it does, you should run, not walk, to the Kirk Douglas Theatre in Culver City. Strictly speaking, this is a one-actor play. In reality, it’s a two-character play: Hurt and an old reel-to-reel tape recorder. The machine, with its collection of tapes, is a time capsule of Krapp’s (Hurt) life and it might as well be a living entity for all the long-ago emotions it stirs up. As the 69-year-old man starts and stops, restarts and stops again, a recording of his 39-year-old-self reflecting on both that time in his life and his still earlier 20-something-year-old-self, he is by turns appalled, rueful, scornful, embarrassed, amused and nostalgic. But is it? Krapp’s long pauses between the taped segments and his baleful stares into the far distance — or his own distant past — suggest otherwise. 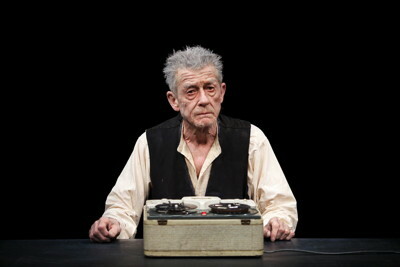 While the aging, dispirited Krapp might not be Beckett disrobing himself to the world (critics and biographers still debate this), this character does examine his life – and finds it sad. His performance, ably assisted by director Michael Colgan of Gate Theatre Dublin, is greatly enriched by his own body. Here’s how Beckett envisioned the character: “white face, purple nose, disorderly grey hair, unshaven, near-sighted, hard of hearing, cracked voice, labored walk.” Like the Appalachian Mountains of the East Coast, worn down and eroded by several hundred million years of weather, Hurt’s sorrowful, pouchy eyes, creased cheeks, furrowed brow and sagging jowls are the marks of a man worn down by a life of disappointments, missed opportunities and paths not taken.